One year after the hugely successful 2017 World Snowshoe Championships, Saranac Lake begins a new tradition. Tucked between the High Peaks Wilderness and McKenzie Mountain Wilderness areas, just under ten miles west of Lake Placid, Saranac Lake’s 5,000 villagers are preparing for the second coming of the World Snowshoe Championships. 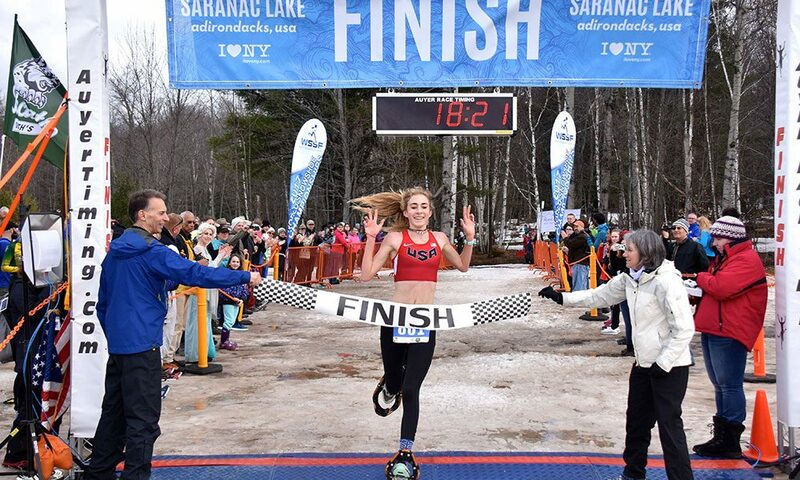 Last year, more than 400 people flocked to the small Adirondack town to participate in the 10K Open World Championship, 5K Junior World Championship and 5K Shoe-Be-Doo Walking party. This year’s set-up is in many ways less chaotic, since it’s looking like there’ll be enough snow to go around. (Though, with 60s and 70s in the weather forecast this week, it’s anybody’s guess.) “We had a terrific meltdown last year,” says Rich Shapiro, Saranac’s Village Trustee. “It was in the 50s…we ended up getting 125 truckloads of snow—municipal dump trucks; the big ones—and about 100 people from the village came out with shovels and plastic sleds and helped spread it around.” They managed to prepare the race courses just in time for a fairly whimsical sight: snowshoed runners, sweating through tank tops in the balmy weather, navigating their way to the finish line. Now, the village of Saranac is building on this successful first run. The inaugural Adirondack Snowshoe Fest is set to begin on Saturday, February 24, with a 10K and 5K Shoe-Be-Doo at Dewey Mountain. Sunday’s 15K and 5K races will be held at Paul Smith’s College Visitor Interpretive Center (VIC). All races will offer cash prizes to the top three places, male and female. Not that you have to compete to enjoy the Snowshoe Fest—on Saturday, there will be guided snowshoe tours of Dewey Mountain; an after-dark, under-the-lights Snowshoe Stomp between bonfires and hot chocolate stations; and an under-the-lights snowshoe hike through the woods. When everyone’s ready to warm up, Dewey Mountain Lodge will be serving chili and cornbread. On Sunday, the VIC is hosting a snowshoe tour, scavenger hunt and obstacle course for all ages; and the world premier of Saving Snow, a documentary about ski towns fighting climate change. You don’t have to be a winning runner to take home a prize. “All competitors get their numbers put into a hat,” Shapiro says. “We have prizes from Hotel Saranac Lake, and snowshoes will be given away.” In addition to Hotel Saranac Lake, the Adirondack Motel and Adirondack Health make up the handful of local businesses supporting the event.